12" x 16" x 24"
A piece I built in 1993 and refurbished in 2018. 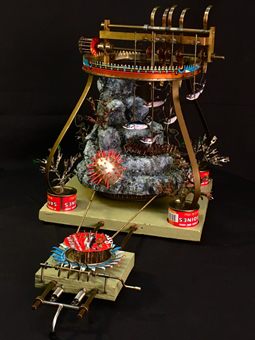 It is an ancient ancestor, as it were, of Tantalus Mackerel, which I built in 2005. Inspired by the works of Alexander Calder and American folk art generally, this piece is largely made from litho-tin cans that had contained fish in them (i.e. sardines, tuna, and anchovies), some of which are no longer available, having been replaced by paper labels. One could say that this sculpture represents my attempt to reconcile my love for seafood with my love for life, by reincarnating the spirits of the deceased fish in a new form.